Many know the traditional data center as the server, storage, and virtualization stack. By that I mean that it has a disparate inventory of Intel-based servers, a.k.a compute nodes, with a dense composition of memory, CPU cores, and network interface ports. These compute nodes will probably have a no-disk footprint, or just enough disk space to install a very small image of a virtualization operating system (e.g., hypervisors like VMWare ESXi or Microsoft Hyper-V). At the bottom of the stack, you will find one or more humongous disk storage arrays, which is the repository of all the data, virtual machine images, and perhaps backups. Many data centers have several different storage arrays with specific use cases or workloads. Storage arrays have built-in controller systems (another set of embedded Intel-based servers) that are purpose-built for managing and provisioning logical capacity, I/O, performance, and disk services. Another set of devices called fabric switches connect to the compute nodes and communicate to the front-end storage array controllers to ensure high availability and shared storage capabilities in a shared or clustered format. That’s just the physical part. The logical and virtual architecture requires software and cluster management to ensure that all these physical devices interact with each other harmoniously in a complex data center environment. Mind you, this is just the tip of the iceberg. The rest of the functions and features of this stack would require a much longer article, and we are only talking about a single data center or a single stack. Some organizations have multiple stacks across several data centers doing either redundant or unique things. The traditional architecture is somewhat hardware-centric. This means that in order to manage, operate, administer, scale/upgrade, and troubleshoot, you must touch each of these disparate systems while also making sense of it as a whole. Don’t get me wrong, this architecture is a proven design. It exists (and has existed for many decades) in everything from the smallest data closets to the largest data centers. Many will keep maintaining and renewing the components to preserve this type of a stack. Hardware manufacturers continue to produce devices specifically for this design, and the likelihood of it going away soon is slim. Now that you’ve had a crash course on the traditional architecture, let’s dive into hyper-converged infrastructure, which is also referred to as a software-defined data center (SDDC). Unlike the traditional hardware-defined data center, in this data center, the compute nodes, storage array, storage fabric, and virtualization stack are all rolled up in a hyper-converged node or appliance. Essentially, it’s a server CPU/memory with built-in storage and a disk controller installed with a hypervisor and hosted virtual machines and data. So why all the hoopla and fancy terms when it’s only a standalone server? Well, it’s actually a lot more than that. In a software-defined, hyper-converged architecture, all those physical devices (especially the storage and fabric) are abstracted from hardware and presented to the virtualization stack like it is a legacy traditional design. Hence the term software-defined data center. The aggregation of these components in a redundant or N+1 (or more) system makes up the hyper-converged infrastructure. The controllers, fabric, and virtualization are all running as modules or virtual components in the hyper-converged nodes. Should a node fail and take down access to the compute and storage, the redundancy of the nodes is designed to allow the data center to sustain operations and availability. Hardware inventory footprint reduction. Hyper-converged infrastructure results in reduced data center environmental costs, such as power, rack space, cooling, and cabling. Single management console. Manage your server, storage, and fabric stack, all in one pane of glass. This simplifies the need to troubleshoot and manage multiple systems. You get a holistic view of your environment in one management console. Non-intrusive and streamlined scaling. Forklift upgrades of antiquated technologies become a thing of the past. Advanced technologies. Take advantage of the innovative technologies used by enterprise-class storage systems. Cloud experience. Use orchestration and automation tools right out of the box, making it easy to deploy and provision. Greater application support. Hyper-converged infrastructure supports a wide variety of applications and workloads that would typically require enterprise-class hardware. Multiple data center reinforcement. Great for multiple data centers supporting various topologies, like replication, data protection, active-active, and cloud scaling, right out of the box. Improved ROI and reduced TCO. Spend less and get more out of your investment than you would with traditional architectures. I can go on and on describing how great hyper-converged infrastructure is, but the more important determination is whether or not it is a good fit for your organization. Examine the reasons above. Do they align with your organization’s goals and objectives? 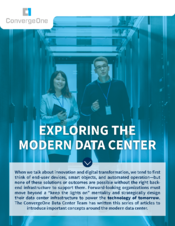 If the answer is yes, it’s time to begin the process of moving to the modern data center.